For all of the talk about how Patrick Smith (77 kg, Minnesota Storm) didn’t quite “have it” a season ago, he sure did his part to put any remaining chatter to rest earlier this evening. 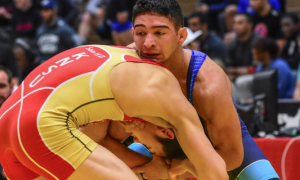 The finals for Day 2 of the 2019 Dave Schultz Memorial International at the US Olympic Training Center in Colorado Springs began at 6:50pm (MT) and were broadcast live on FLOWrestling. Smith weathered a late onslaught from fellow 2017 World Team member Mason Manville (Army/WCAP) to secure his first-ever gold at the event. Leaning on a pressurized attack in the first, Smith was able to goad a passive point, though his follow-up on the mat failed to yield an additional score. Manville, who employs a similar style to Smith’s, observed a relentless pace in his own right. Both hunted down occasional two-on-one’s through much of the opening frame, though neither athlete came all that close to capitalizing on the tie-up. The second period brought out an even-more impassioned Manville. He energetically chugged along, but he didn’t need to try too hard to find Smith, as the Storm grappler was constantly in his face. As the period wore on, Smith roped a two-on-one and yanked it high enough near the line to put Manville off-kilt. The takedown made it 3-0, but Manville cut into the lead when his passive chance arrived. From bottom, Smith defended, and back to the feet they were for the race to the finish. With time a factor, Manville had to go. He tried hawking deep on an arm throw and nearly came out the back. In the melee, Smith ambled up and faced Manville, who was perilously close to the edge, and Smith’s momentum carried forward enough to earn another step-out. The Army side challenged the call, but it was upheld. Manville went hyper-speed to the whistle, as you might suspect. Nevertheless, Smith stayed on his feet the rest of the way to earn the 5-1 decision. 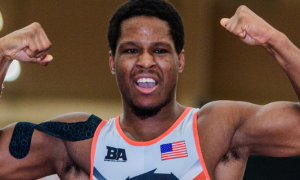 Two high-profile US Seniors earned their second Dave Schultz Memorial titles Friday night– Kamal Bey (82 kg, Sunkist, world no. 7 at 77 kg) and G’Angelo Hancock (97 kg, Sunkist). Bey had a fight on his hands in the form of 2018 U23 World Team member Carter Nielsen (Minnesota Storm/OTS). Nielsen torqued hard on an early two-on-one that forced Bey to try and scramble out of. When Bey got clearance, Nielsen burrowed forward and coaxed an easy step-out. Another step-out entered the equation following the restart, but this time it was of Bey’s own making. He had flashed in on angle and Nielsen pivoted just as Bey was on the edge. Bey screeched towards Nielsen after the next reset and trucked a takedown to go up on criteria. In the second, Nielsen was penalized for a caution-and-two, finger-grabbing. And then later in the frame — as Bey lasered towards another shot at the body — Nielsen was banged for fleeing. Still, he carried on, despite appearing taxed. Four points is four points. One move, one attack. That deficit was trimmed even further when Bey himself couldn’t dodge the caution bug, bringing the score to 6-4. A couple of last-gasp looks on Nielsen’s part were deflected, giving Bey his second Schultz gold. In a rematch of the 2018 World Team Trials challenge tourney final, Hancock greeted National Team member Lucas Sheridan (Army/WCAP) and got off to a sizzling start. Sheridan was nailed for the first passive, and Hancock wasted no time in rotating three concurrent guts. But — that was that. Perhaps due to it being the first time out this season for both, or a hesitance to open up for attacks — either way, no other points were scored in this contest, which was won by Hancock 7-0. The return of Jon Anderson (87 kg, Army/WCAP) to Greco-Roman competition brought with it a requisite amount of fanfare, and deservedly so. One of the nation’s best athletes, Anderson is also a Major in the US Army who recently arrived home after serving in Afghanistan for nearly a year. 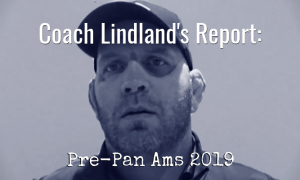 He also put together an impressive, gritty performance on Friday, starting with his come-from-behind victory over National Team member Kevin Radford (Sunkist) and his criteria decision against two-time World Teamer Cheney Haight (NYAC). The finals offered Anderson a suitable test — Alan Vera (Florida Jets). Anderson and Vera first met in the 2015 when the latter was a member of Cuba’s National Team. It was a famous match. Anderson wore Vera out and eventually won the tournament. Now, Vera is a USA competitor, meaning that he will be thrusted into the overcrowded field at 87 kilos. Which also means that he will be someone for Anderson — and Patrick Martinez (NYAC), Ben Provisor (NYAC/NLWC), Joe Rau (TMWC/Chicago RTC), and Jake Clark — to deal with. On this night, Vera, suffice it to say, was an awful lot to deal with. An immediate clash of heads resulted in a cut lip for the Cuban defector and a mouse under Anderson’s eye. When action resumed, Vera swooped into double under’s and deposited Anderson to the mat for a takedown. Another time-out followed so the Army rep could get patched up once more. Vera added a step-out and his second takedown of the match before the end of the period. Soon into the second, Vera collected his second step-out and then received a passivity point. But this is when it almost all came crashing down on him. As he assumed his lock and went to roll, Anderson floated over and briefly had Vera dead to rights. If Anderson had been able to keep him there for an extra eye-blink, a fall might have resulted. But Vera flopped to his stomach, his reprieve. A subsequent lift attempt for Anderson came loose. With under a minute to go, Anderson crashed towards the body but didn’t have the leverage. Vera scooped under the arms and re-directed the motion off the edge for four points, thus sealing the match :07 prematurely. 2016 US National champ and former Junior World bronze Toby Erickson (130 kg, Army/WCAP) was looking for his second Dave Schultz Memorial gold on Friday, and appeared to be in prime position to lock it down entering the second period against Georgian Gocha Davitadze. Erickson had taken advantage of the first passive/par terre chance, scoring on a gutwrench. But in that conclusive stanza, Davitadze repaid the favor. From par terre, he gutted Erickson over three times before the US athlete reversed to get a point back. Visibly tired, Davitadze was fading fast while Erickson was unquestionably the fresher athlete. And he had a shot. A caution on the Georgian for fleeing put Erickson within one, though there were only :37 remaining. Erickson poured it on as best he could from there, but was unable to capitalize further.